Blogger Blakely Stein of Lady Love Food lives in the jungle of Costa Rica, where she surfs, teaches yoga and cooks for monthly Jungle Soul Table events. Find her on Facebook, Instagram (@ladylovefood) and Twitter (@blakelystein). In the heat of the day, with no desire to prepare lunch, I walk over to Juan’s fruit stand for an ice-cold pipa (coconut water), a bag of plantain chips, a lime and an avocado. My hands carefully brush over the black bumpy skin in search of perfection—a score that’s not too soft, not too firm, just right and ready to eat. Juan watches me with trepidation that I might bruise some of his sacred stock. At a mere 500 colones a pop, which translates to roughly a dollar each, these babies are edible dreamboats. I crave the crunchy, creamy, salty meeting of a perfect avo with fresh chips made from the region’s abundant plantains. But I’ve also found many more uses for the green super food, an ingredient I wouldn’t want to live without. Grown throughout Costa Rica, avocados are as delicious as they are teeming with nutrients. The fruit is a natural source of lecithin (a.k.a. brain food) and rich in minerals such as copper, which assists in red blood cell formation. See Healing with Whole Foods: Asian Traditions and Modern Nutrition, by Paul Pitchford, for many more excuses to eat them. Needless to say, I never miss a chance to satisfy my avocado love. I massage it into kale, add it to salads, smoothies, desserts and dips, and use overripe ones to moisturize my skin and hair—you can literally rub it all over yourself Here, five recipes to satisfy your own avocado obsession. Ice cream: Combine 2 frozen bananas, ½ avocado, a handful of mint, 1 Tbsp. of honey and a sprinkle of salt in a high-speed blender until creamy. Cacao sauce: Melt 3 Tbsp. of coconut oil and 1 Tbsp. honey. Whisk in 1 Tbsp. cacao. Put ice cream in a bowl and drizzle with cacao sauce. Put the bowl in the freezer for 10 minutes or until the sauce has hardened. Enjoy immediately. 2. Lavender avocado hydrating face mask: Mash 1 cold avocado with 6 drops of lavender for a soothing and hydrating face mask. Apply to face and massage into hair, leave on for 20 minutes. Rinse and moisturize with coconut oil, cacao butter or shea butter. 3. Ginger-sesame avocado dip: Combine 2 mashed avocados, a grated 1-inch knob of fresh ginger, a drizzle of toasted sesame oil, a squeeze of lime, a sprinkle of sea salt and a small handful of chopped fresh cilantro. Top the mixture with toasted black sesame seeds and serve with spring rolls, corn chips, Asian slaw or grilled fish or chicken. 4. 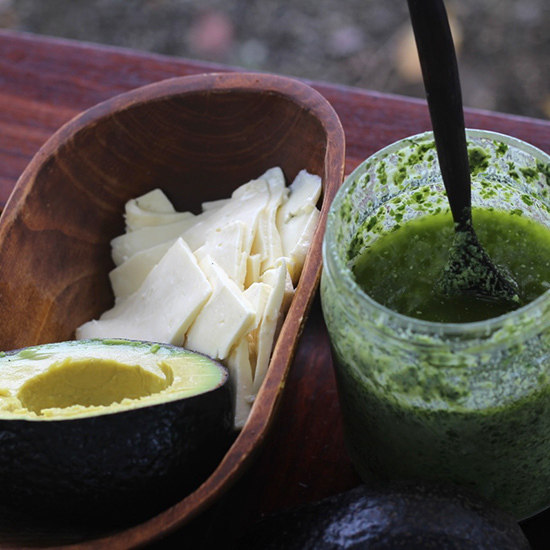 Supercharged morning smoothie: You can use ½ avocado in place of a banana in any smoothie recipe. Or for a creamy-smooth drink with less sugar than some smoothies, in a blender, combine ½ cup frozen blueberries, ½ avocado, 1 Tbsp. maca, 1 Tbsp. spirulina, and ½ cup to 1 cup of coconut water, almond milk or coconut milk. 5. Vegan herb and garlic aioli: Puree 2 avocados, add a handful each of chopped dill and parsley, juice of ½ lemon, 1 minced garlic clove, a drizzle of olive oil and a pinch of sea salt. Serve with dishes like steamed artichokes, veggie sandwiches, crispy fish, Parmesan-crusted chicken, fried yuca or roasted sweet potato fries.